Using a cell phone - even a hands-free one - while driving quadruples the risk of getting into a crash with serious injuries, a study finds. Research released Tuesday by the Insurance Institute for Highway Safety suggests that using a hands-free device instead of a handheld phone while behind the wheel will not necessarily improve safety. "You'd think using a hands-free phone would be less distracting, so it wouldn't increase crash risk as much as using a handheld phone. But we found that either phone type increased the risk," said Anne McCartt, one of the study's authors and the institute's vice president for research. The study found that handheld devices were very slightly riskier than hands-free ones, but the difference was not statistically significant. The study, published in the British Medical Journal, found no difference in the risk posed to male and female drivers or to drivers older and younger than 30. More motorists are using cell phones on the road than ever, and lawmakers are grappling for ways to reducing driver distraction. 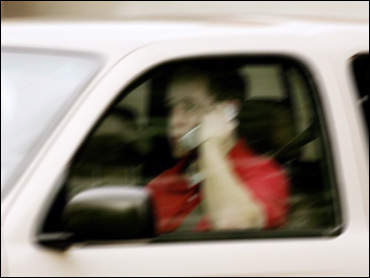 Talking on handheld cell phones while driving is banned in New York, New Jersey and the District of Columbia. In Connecticut, drivers will have to use hands-free devices beginning Oct. 1. Some cities, such as Chicago, Santa Fe, N.M., and Brookline, Mass., require hands-free devices in automobiles. Eight states - Florida, Kentucky, Louisiana, Mississippi, Nevada, New York, Oklahoma and Oregon - prevent local governments from restricting cell phone use in motor vehicles, according to the National Conference of State Legislatures. The study found injurious crashes were four times as likely when drivers were using cell phones. It studied 456 drivers in Perth, Western Australia, who owned or used mobile phones and had been in a crash that put them in a hospital emergency room between April 2002 and July 2004. Each driver's cell phone usage during a 10-minute interval prior to the accident was compared with use during at least one earlier period when no accident occurred. Each driver, in effect, served as his or her own control group in the study. The institute tried to conduct the study in the United States but could not get access to records from phone companies. Phone records were available in Western Australia, where handheld phone use has been banned while driving since 2001. Weather was not an issue in the crashes, with nearly 75 percent occurring in clear conditions. About nine out of 10 crashes involved other vehicles and more than half of the injured drivers said their crashes happened within 10 minutes of the start of the trip. Many studies examining cell phone use in vehicles have been based on police reports, but critics say those records are unreliable because it is difficult to corroborate whether a driver was using a phone. Jim Champagne, chairman of the Governors Highway Safety Association, said the study reinforced the need for driver education. His organization urges state lawmakers to refrain from enacting handheld cell phone bans because they "incorrectly send the message to drivers that as long as they are hands-free, they are safe."